The Coquille Indian Tribe’s Community Health Center invites you to support your good health at the Kilkich Fitness Room. 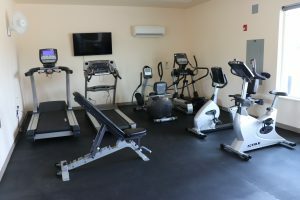 The Fitness Room provides a convenient location and quality exercise equipment for Tribal members, housing residents, clinic patients and Tribal employees to pursue your personal fitness goals. All without paying a membership fee! 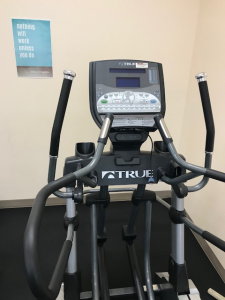 At the fitness room, you can rev up your metabolism on a cardio machine, focus on strength training with free weights, or roll out a yoga mat. A flat-screen TV offers fitness classes and exercise routines, including aerobics, cross training, stationary biking and yoga. There are videos to guide beginning, intermediate and advanced users. Who can use the fitness room? Parental supervision is required for any user younger than 18. Children 12 and under are not allowed in the Fitness Room. Please remember to wear appropriate clothing and footwear. If you’re new to fitness or have not exercised in a while, please talk to your health-care provider to be sure you are physically able to use the equipment provided. Mail the completed agreement to: CIT Community Health Center, Attn: Carol Gilkey, P.O. Box 3190 Coos Bay, OR 97420. Or scan and email the completed agreement to carolgilkey@coquilletribe.org. Pick up your access card at the Community Health Center during regular business hours.